Fathia balogun is a popular and multi award winning Nollywood actress who started her acting career in the early 90s, she mostly show in Yoruba movies and she’s been featured in a lot of movies since she started. She’s mostly loved by fans for her very pretty and non-aging looks. She attended Olufunmila Nursery School, Ikeja, Lagos State. Maryland Primary School, Maryland, Lagos State. Maryland Comprehensive High School, Lagos. Kwara State Polythechnic, Kwara State. She was born into a polygamous home and a family of nine (9). She family was very much middle class with a fair balance in her parents wealth. She had a Catholic background and grew up in Ikeja where she did a lot of her early education. Parents: Mr & Mrs Williams Brothers: Ken Williams, Anderson Williams, Charles Williams Sisters: Joseline Williams, Stella Willams. She was a general receptionist at Chips Bit & Bit, a Computer Company on Toyin Street, Ikeja, Lagos back then and she was earning 5,000 naira per month. She do not know whether to call it fate or coincidence! Alhaji Fatai Teniola introduced her into the Industry by casting her and It all started in the early 90’s. Nollywood actress, She disclosed that acting was never part of her dream, saying she had wanted to be a broadcaster, even though her father wanted her to be an accountant. The actress stated that she could not achieve her dream because she could not pass her JAMB exams and as a result of staying at home for so long, her father had to give her the freedom of doing whatever she likes. She also revealed that she had to give law a trial but could not cope because the extra work needed by law students in school. Speaking with the Nation newspaper, she said, “After several attempts with JAMB, because my maths was poor, and coupled with the fact that I was staying too long at home, my father advised that I go on to do whatever pleased me. “So, I went to study diploma in Law at Kwara State Polytechnic, Ilorin. But that one too became too wide for me, the reading was getting too much. I left and travelled to the UK. By that time, I had been introduced to acting. DUE TO INSUFFICIENT CONTENT TO WRITE THE FULL BIO WE WILL SHOW YOU A DETAILED 2009 CAREER&LIFE INTERVIEW. We plan on getting a recent interview with her very soon. The task of growing up (experience-wise) and handling the fame of becoming a recognisable star were some of the hurdles I had to cross back then. In spite of all I am still standing and I thank the Almighty God. Quite a lot: Owo wunmi Omo britiko Omo ose paro IOfe (Love) Afi Suru Ori to mention a few. As a DYNAMIC, OUTSTANDING, ‘A’-List Actor, how have you managed to adapt to the different range of roles you have played in your career? I am familiar with the system and anything that comes across, I take it up as a challenge and do it. I believe that is what you will call ‘taking it in your stride’. I don’t think I have had any irritating role, because every role is meant to show exactly how it happens in the real world and positively influence the viewers. We are just acting. In a Nation wide Television Programme “Super Story – face of deceit”. Because I had to play the role of an aged woman (42 years precisely) and you know what, it was very interesting. I had a great time. As an ‘A’-List Actor yourself, what other ‘A’-List Actors or Actresses have worked or collaborated with? Yinka Quadri, Saidi Balogun, Jide Kosoko, Adebayo Salami, Sola Sobowale, Peju Ogunmola, Ronke Oshodi Oke, Moji Olaiya, Remi Oshodi,Odunlade, Funke Akindele et.c. I think I just love the job I do because any time I am on set, I am always very happy. How do you manage to harness, keep and pass them across in your films? A well thought-out script, with proper revision where and when necessary is a key. Furthermore, we live the life and still have knowledgeable people (elders) within our communities, and sometimes borrow this wisdom to keep us a step ahead. What do you do or how do you pass the time? I relax by way of sleeping, watch films and rehearse scripts I have written or that I am contracted to do. What other messages do you have for your international fans in America, United kingdom, Europe, Africa and its Diaspora? I request for more prayers from them. They should also bear in mind, I am privileged to be in a position to entertain them, and without them and God, I am nobody. If we invited you to America, UK or anywhere else to meet your fans, will you be available to meet them? She has starred, produced and directed several Nigerian films over the years. In 2008, she won the Africa movie Academy Award for the Most Outstanding Actress Indigenous and her movie Iranse Aje won the best indigenous film of the year. On April 2014, she won the Africa Movie Academy Award, having emerged as best actress of the year alongside with Odunlade Adekola who emerged as best actor of the year Faithia Balogun also won the Best Indigenous Language: Yoruba award for the work done in the film Iya Alalake at the 2015 Africa-Magic Viewers’ Choice Awards AMVCA. Fathia Balogun is a popular Yoruba actress who got married to Saheed (Saidi) Balogun in the early days of her career together they had 2 kids untill they got divorced due to Infidelity issues according to the media. SEE A 2015 INTERVIEW OF FATHIA ON MARRIAGE. 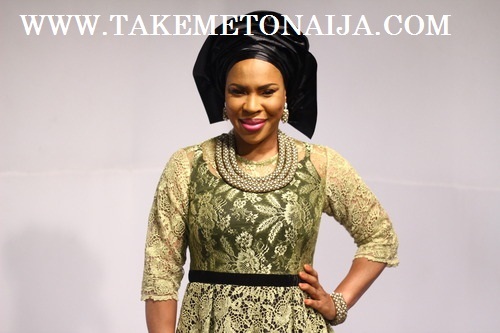 Fathia Balogun in an interview with City People says she is still married to her estranged hubby, Saidi Balogun who recently got married to Funke Tayo Sofowora. Read ALSO: Beautiful Pictures Of Gurara Waterfalls Niger, See Interesting Facts about the place too! Even though the reporter gave her instances and facts that they are no longer together anymore, that still didn’t Fathia as she insisted they are still married and they would still be married. Saidi on the other hand claims to have moved on when he spoke to City People. You still bear his name, what will you say about it? Do you want me to drop the name? No I am just asking, why don’t you want to drop the name? Why will I drop the name? I have two beautiful kids, Khalid Balogun and Aliyah Balogun, so tell me why I am going to drop Balogun. Assuming you are in the American Embassy and you are being asked, are you still married? There is a story we gathered that Saidi Balogun is married. What would you say about it? Have you gotten that news? No. I think I am hearing it for the first time here. You have not read it in the papers? That he found a new love? What if he now decides to get married? Saidi is a Muslim, yeah. Even on our engagement day, it was said that ‘Mee ni Olorun wi, Saidi can marry 4 wives, 3, 20. Iya le ni mi (I am his first wife). They can come in it, doesn’t matter now. Ofcourse, why not? If it is my turn, it is my turn. If Saidi is married up to 1-10, won ma pin ojo ni. So, when it is my turn on Friday, no one would argue with me that Friday is not my day. Don’t you get, nobody will argue about that. She signed a multi million naira endorsement deal with a business brand SURU GROUP in 2012. The actress have been connected to scandals which some are rumors according to her.